I know it's no longer wednesday, but i was lazy, so yeah, here's the Wednesday EOTD! 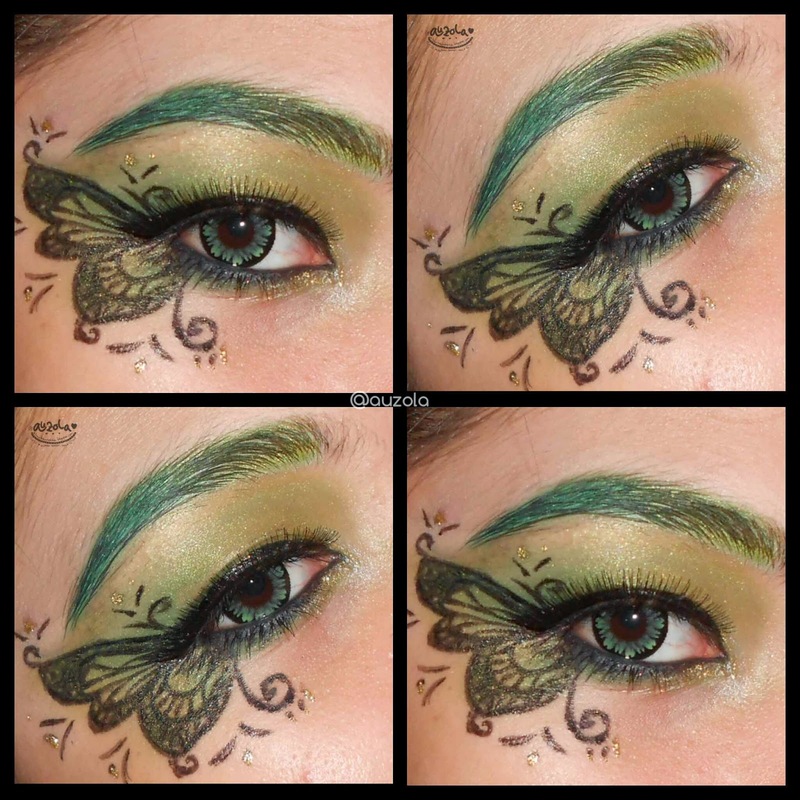 Hahaha, the theme was Butterfly and i decided to create a green butterfly wing! Check it out! So, instead of going for pink color, for this butterfly i choose green. Why green? Hahaha idk, i just thought it looks more earthy and looks like a forest fairy hahhaa. I had no idea what kind of butterfly i want to make because i always think that is hard to create a butterfly or fairy wings on your eyes, i mean the details gonna be super hard. But thankfully i still managed to took pictures of the steps! Hahaha. Even thought the details is a bit messy, i still think it's good enough. Hehehe, like always, practice makes perfect, so doesnt matter if i didnt do it super good today, because i still have tomorrow to learn! 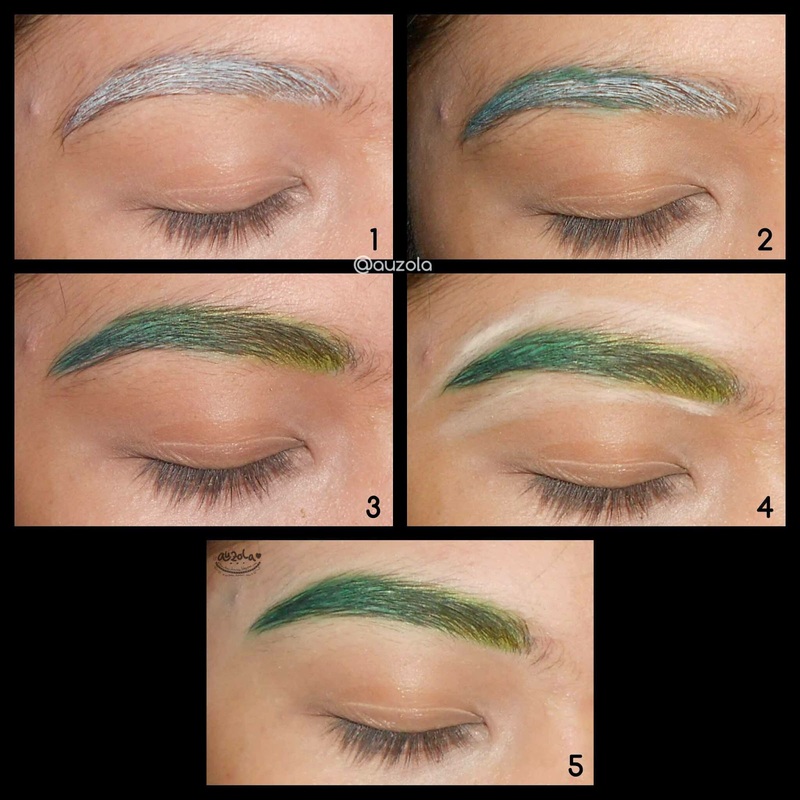 First, this is the eyebrow tutorial, since like you probably have notice that the eyebrow is a dark and lighter green ombre. 2. Outline your eyebrow with pencil or eyeshadow. 3. Fill in with darker grey on the outer eyebrow and lighter for the inner and make sure to blend them. 4. Apply concealer and blend to your skin evenly. Now, for the eye makeup! Yeah it's a bit long because it's almost full step by step. 1. Prime your eyelid and apply darker green on your outer lid. 2. Apply lighter green to the other part and blend them well so there'll be no harsh line. 3. Draw your eyeliner to a classic bar type. 4. 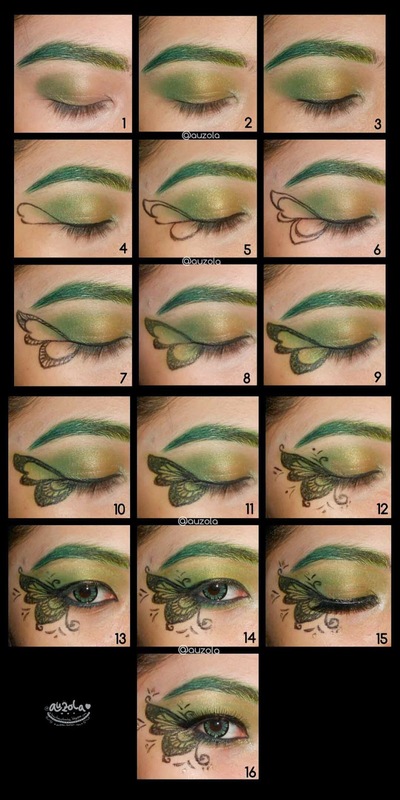 Draw the upper wing of your butterfly with eyeliner for an outline. 5. Draw the lower wing and add more detail on your upper wing. 6. Also do the same with your lower wing and the middle part of both wings. 7. Add details to the gap with straight line. 8. Fill the butterfly wings with colors. Darker grey for the inner part and lighter for the rest, then blend them. 9. Thicken the side details of the wing so it looks more fibrous. 10. Draw a details inside the lower part of the wing. 11. Also draw details inside the upper wing to make it more like a butterfly wing's motive. 12. Add cute details outside the wings. 13. Apply black eyeliner to your lower lash. 14. Add darker and lighter green eyeshadow below your lower eyeliner. 15. Apply a gold eyeliner for even shinier look in some part of the details. 16. Put on your mascara and falsies of your choice. 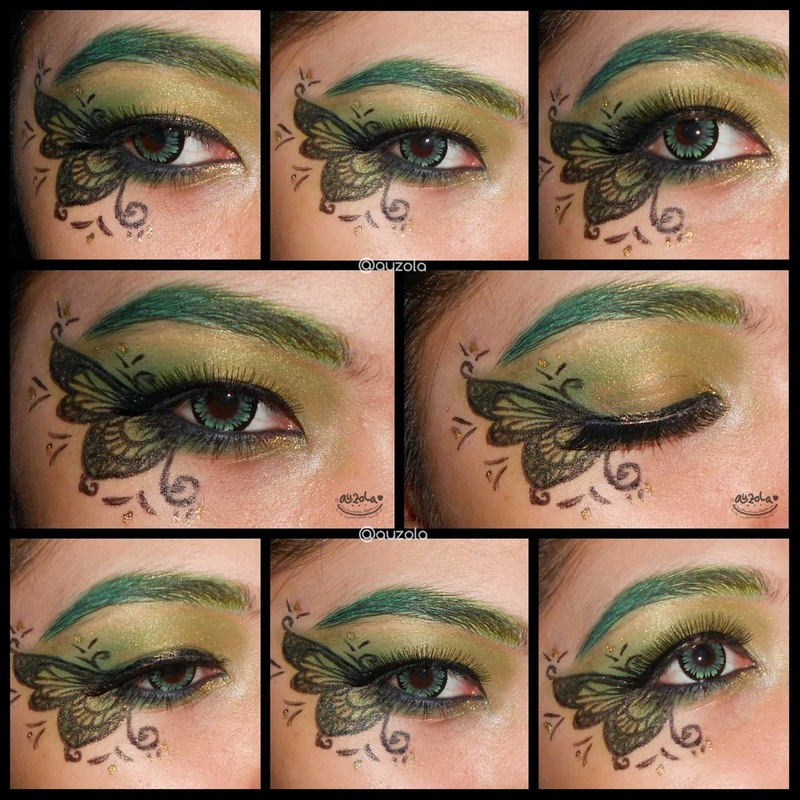 Thats all, i hope you like my butterfly EOTD creation! And i hope you understand the tutorial as well, hahhaa!